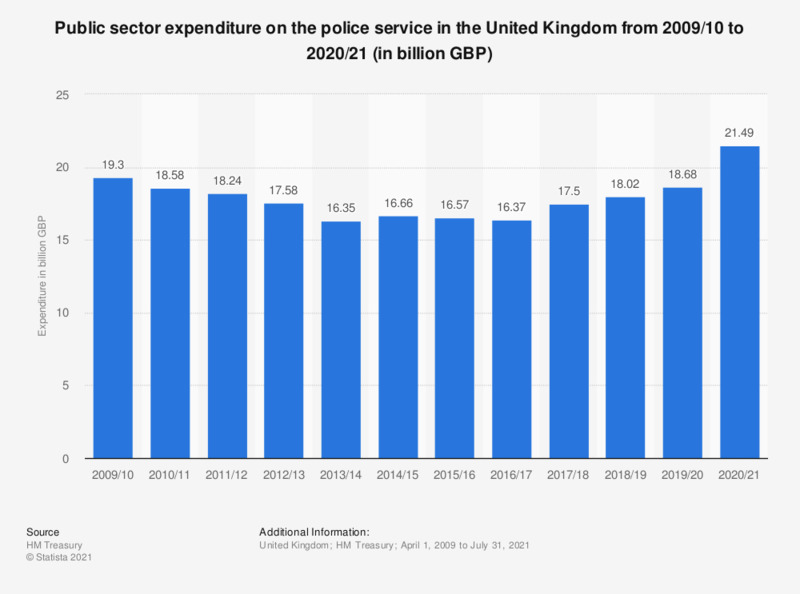 This statistic shows public sector expenditure on police services in the United Kingdom from 2009/10 to 2017/18. Expenditure on police services fell between 2009/10 and 2013/14 by approximately 3 billion British pounds. From 2013/14 until 2016/17 police expenditure fluctuated between a low of 16.35 billion in 2013/14 and a high of 16.66 billion in 2014/15. In the most recent fiscal year of 2017/18 spending increased to 17.52 billion British pounds. Everything On "The police service in the United Kingdom" in One Document: Edited and Divided into Handy Chapters. Including Detailed References.